PHILADELPHIA (AP) — Double-amputee Jason Koger used to fly hundreds of miles to visit a clinician when he wanted to adjust the grips on his bionic hands. Now, he's got an app. Koger came to Philadelphia this week to demonstrate the i-limb ultra revolution, a prosthetic developed by the British firm Touch Bionics. Using a stylus and an iPhone, Koger can choose any of 24 grip patterns that best suit his needs. It's the latest evolution in equipment for Koger, a 34-year-old married father of three from Owensboro, Ky., who lost his hands in an all-terrain vehicle accident in 2008. "Five years ago, I couldn't pull my pants up by myself," said Koger. "Today, I go hunting and do some of the things that I probably never imagined I could have done five years ago." The technology indicates how rapidly the field of prosthetics is changing, benefiting patients from injured military members to victims of the Boston Marathon bombing. Practitioners say increased government research in the wake of the wars in Iraq and Afghanistan is driving some of the advances. In Koger's case, he was shocked by a downed power line. He went into a coma and had no idea until he woke up three days later that doctors had amputated both his limbs at mid-forearm. His wife spent those three days researching prosthetics, Koger said. Since then, he's used a variety of prostheses, which he considers like tools — different extensions for different tasks. Electric hooks have allowed him to pursue his passion for hunting. Myoelectric hands, which react to electrical impulses generated by his remaining arm muscles, offer more precise movements. The previous version of Koger's myoelectric device required programming by a prosthetist, meaning Koger had to fly to Advanced Arm Dynamics in Dallas. The prosthetist would work with Koger to pick a few grip patterns — such as pinching, pointing or shaking hands — to program into the i-limb. Yet sometimes Koger would get home and realize they weren't the ones he needed. Now, the latest i-limb comes with iPhone or iPad app that allows Koger to reprogram his hand with the touch of a stylus. 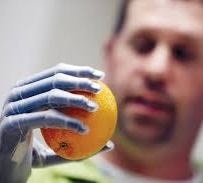 On Thursday, he demonstrated by gripping an orange, a baseball and a can of soda. The i-limb allows fingers and thumbs move independently to conform around certain objects, said Ryan Spill, a prosthetist for Advanced Arm Dynamics' new office in Philadelphia, who is working with Koger. The thumb is also motorized, not passive, as in previous prostheses. The Boston Marathon bombings, which wounded more than 260 people including many with serious leg injuries, have shined a light on the advances in prostheses. But experts note that technology for upper extremity bionics, which involve fine motor skills, is much different from what's needed for lower extremities, which focuses on weight distribution and gait. There have also been huge advances in computerized knees and feet, said Joe Reda, assistant director of orthotic and prosthetic services at the Kessler Institute for Rehabilitation in West Orange, N.J.
"The changes are happening rather rapidly now and I think it's because of our wars overseas," said Reda. "The government is trying to put more money into research and development." The i-limb ultra revolution costs about $100,000, though some insurance might cover it. Koger, who received his free in exchange for testing them and providing feedback, met Friday in Philadelphia with other amputees interested in the new technology. Mark Dowling, 50, of Newark, Del., lost his arm to cancer several months ago. He said he cried while watching Koger demonstrate how the hand worked. "I'm very touched with his story," Dowling said.